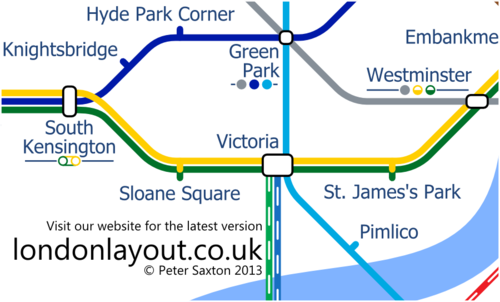 I have run two Kickstarter campaigns for my London Layout project. With my second just finished here are some of the lessons that have learned. There are many other great sites on this topic one that goes particularly in depth is from Stonemaier Games. This is primarily a list of things that I had not taken enough heed of in my campaign preparation. Use the tools and learn what to expect. Kickstarter campaign dashboards contain lots of useful information for a creator but there are tools online which will give you more. I followed my projects on Kicktraq. This site has daily data and predictions of the final pledge amount for every project they are tracking. Data from past projects is also available and allows you to see how a typical campaign proceeds. Kickstarter also makes available data on the average behaviour of campaigns. Generally most pledges are made at beginning and end with a lull in between. 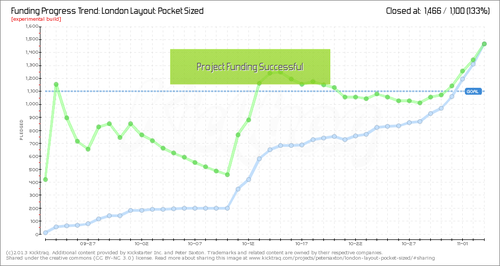 This is why Kickstarter recommends shorter campaigns. This is to be heeded as it is really tempting to have a longer campaign as you believe it might lead to more funds. Of course certain projects are exceptions to the rule and my recent project is one with most pledges coming right in the middle. Getting coverage of your project is really difficult. At the beginning I created a Facebook page for my project which I then shared with all of my friends. This gave a small and valuable jump start to funding but nothing more. No matter how many friends you have on Facebook it is a very small pool. These friends are also not necessarily going to promote your project. Time will have to be spent on promotion. You can be smart and focus your promotion on groups more likely to be interested, maybe you’ll get lucky and find others who do want to shout about your project. Even in the best case there will be a substantial chunk of time selling your idea. If you’re anything like me you just want to get on with working on what your working on and time spent on stuff around it seams a waste. It can’t be avoided. Most importantly put some thought into answering the questions that are often asked ideally before they are asked. The campaign FAQ section is good for this but you ideally catch the questions before then. For my purposes the comparison section of my site proved invaluable. Crowdfunding is not mainstream. This is really important because it means that most people who like what you’re doing have not previously backed a campaign. Some just want to buy the reward, some people think you are asking for donations or investment. In reality crowdfunding is all and none of these. Crowdfunding is becoming more well known everyday, however it is necessary to keep explaining what you are doing particularly away from your campaign page. This also means your best audience is always those who have backed before as previous backers already know crowdfunding. At the time of my first campaign I was a Facebook user. From other social media I was completely absent. After reading about it’s value I decided to increase my online presence. To keep the social media under wraps my golden rule is too check it as infrequently as you can. Also, don’t obsess over stat’s you don’t understand. Facebook provides a viral percentage for posts. I got caught trying to improve this stat without much understanding as to why. The best thing for your project is to get on and do your project. I was very late coming to twitter. In the last week of my second campaign I signed up to twitter. Being active on twitter was entirely responsible for a surge of interest in my campaign during the last week. An expected bonus was an invitation to a crowdfunding conference organised by The Crowdfunding Centre. These connections are the true value of Twitter. It is the people who aren’t your friends/associates/colleges who can contact with you directly. Here the 140 character limit is a bonus as it forces these informal connections to be absolutely on topic meaning they take a minimum amount of time for you to process. People will say nice things. When I first put my project online I worried about harsh criticism. This was not even close to being the case. I had so many positive comments and suggestions during my first project I was encouraged to get my second project going just to tap into this huge amount of good feeling. To make the most of this I forced myself to find the time to message everyone who backed me. (Sorry, to those who backed me in the last few days of my second project I didn’t quite manage to keep up.) Telling my backers about something I was working on or what I was announcing tomorrow was a great way to start conversations. 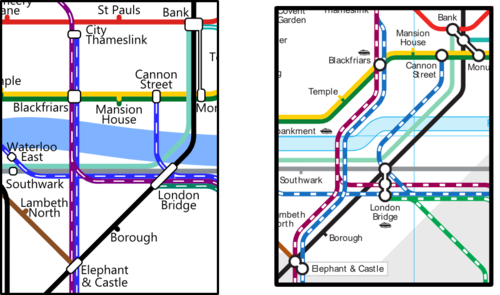 These conversations really helped me think about issues I couldn’t answer myself such as disabled access and how my map looked to the colour-blind. If you have read about some of the runaway successes on Kickstarter you will hear about nightmares that unfolds with fulfilling rewards for so many. With a final number of 99 backers my first project was much smaller, even then unpacking posters, putting them in tubes carefully, copying out addresses, making sure I sent everyone the right reward and keeping an accurate record of all this took time. Although not working on it full time there was still several days when my lounge was covered in cardboard tubes. A campaign has more of these tasks than I realised. A1 is really big, top rewards still need posting. A1 is really big, to wrap a framed A1 poster took a whole roll of bubble wrap (£3) and a roll of brown paper (£2) several pieces of cardboard and I don’t know how much parcel tape. The lesson here is top level rewards are great for rewarding the backers who really believe in your project. BUT they can also take up a disproportionate amount of time to deal with. They can be the source of unexpected costs so make sure you are offering something worth it and check feasibility. During a campaign there will be messages from backers most days. This buzz can really inspire you to get moving, to keep sending out updates and everything else. This is one of the great upsides to turning to crowdfunding. Just don’t let your backers down later. The work lasts after the campaign and it is on your resolve to see it through.